Hi, I'm James O'Brien. I am a Junior this year, and I am an International Studies student with a minor in Asian Studies. I am really looking forward to blogging my experiences in China this spring. I hope to learn a lot about traditional and contemporary Chinese culture, history, and politics. I look forward to sharing all of my experiences with any reader(s)! During a two-week break from Beijing and classwork I experienced the incredible diversity of China’s southwestern Yunnan province. I bonded with my fellow TBC students while there. We were brought together through an extraordinary and trying experience. During our orientation the week prior, TBC staff told us that our time in Yunnan would be challenging. I think this is an apt word, because traveling through Yunnan was no walk in the park. We spent 60 hours in transit, over the course of two weeks, by bus mainly. We visited and stayed in five different villages; we met the Yi people, the Hani, the Dai, the Tibetans, and the Naxi. I wrote the previous paragraph the weekend after returning. I finish this now, after ample reflection, at the end of March. After returning there was a palpable sense of road-weariness, but this must not be seen to overshadow a truly magnificent opportunity. In our orientation we were told that we would be invited into their homes warmly, during the most important family holiday, and would be afforded generous hospitality everywhere we went. This was always the case in my experience. It was truly extraordinary how accommodating and friendly people were. I had many great pictures of the excursion. 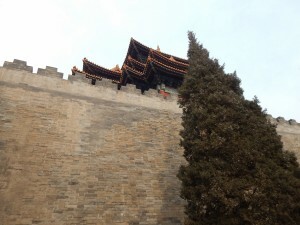 Unfortunately, I lost my camera while returning to Beijing. We left the Naxi village by bus, left Dali by train (camera left on train in Kunming), and then left Kunming by plane. One memory that stands out in my mind is standing on the rooftop of my host father’s home, in the Hani village. The combination of his accent and my beginner’s Mandarin abilities made communication extremely difficult. My host father in the Hani village brought me and another TBC student in that homestay up to the roof of his home, and we looked out to the mountains all around us, and the valleys below. I can say readily that I have never seen such a spectacular view anywhere else in my life, and truly nothing else is comparable. (Except maybe the view of the stars on a rooftop on the Naxi village the week after). While we stood on the rooftop, marveling at mountains shrouded in mist and looking out to a river valley where the sun was setting, my host father pointed in various directions and said a number of things I did not understand at all. I asked a number of questions in an attempt to catch his meaning. The other student on the rooftop realized he was saying, 山 (shan)- mountain. After some more time we realized he was telling us the name of the mountains around us, and the name of the mountain that was home to that particular Hani village. I remember telling him that the view was beautiful, (很漂亮) and he smiled with pride. It is a privilege to study here; I feel truly honored and humbled by my first several weeks in China. I have been so hospitably received that I feel that 对外经贸大学 (University of International Business and Economics) has already become my home. These past weeks in China I have experienced new things every minute of every day. I have tried new food each day; most notably there was something in a soup I was told to eat and not ask any questions about. When our host for lunch was asked if he liked what we tried, he laughed and said he definitely did not. Additionally, I have tried delicious traditional beef noodles from Gansu, hotpot, Chinese style Italian spaghetti with tomato sauce, and 永和大王 (Yong He King)—a Chinese fast food chain for breakfast. At Yong He King I tried Taiwanese soymilk, which is excellent—this is surprising for me because I do not like milk. I have been awed by the grandeur of the Forbidden City—the abode of the Son of Heaven and his court for many hundreds of years. I have seen the Olympic Park and reveled in feats of modern Chinese architecture. I have made many new friends here, and learned so much more about China in the weeks I have been here than the year before, in preparation for my arrival here. The first night here was overwhelming. On that first night I wondered if I was ready for this experience. I wondered whether I could make it through four months. I was plagued with self-doubt that I had never before experienced. For over a year, I had been ecstatic at the thought of coming to study China and there was not a single moment when I questioned my convictions. Over time, I had a realization. There was no way for me to be ready. Nothing could have prepared me to fly across the world, visiting a different country for the first time, to become 外国人 (a foreign person), and to settle in to live here—and in rural Yunnan for two weeks in February—for four months. The only thing that matters is attitude and perspective. On the second day here I woke up remembering the vertiginous excitement I have had for over a year in relation to the prospect of experiencing the historical and cultural wonders of China. On that day I realized that everyone I have met here—Chinese roommates, tutors, and other students in the Beijing Center—have made the greatest effort to be friendly, welcoming, and kind to me. In that moment I was ashamed that I had ever doubted my convictions to come here even for a moment. I recognize now that I know I can already call my roommate 我的朋友 (My friend). I know that he will cheerfully help me through absolutely any challenges (as he has already done so).